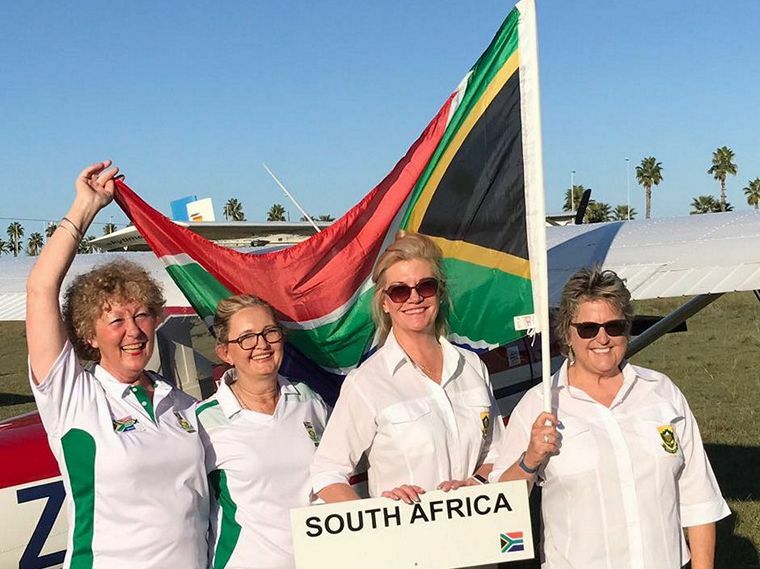 The South African Air Navigation Race team of six excelled at the first ever World Championships of this new and exciting sport, hosted by Aeroclub Castellon, Spain, in September 2017. 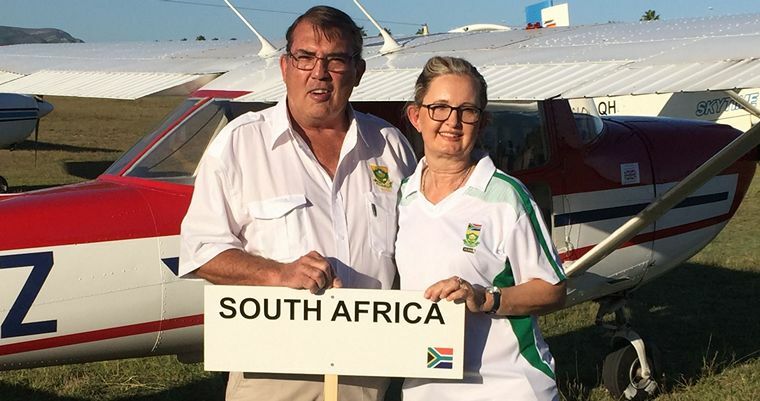 The three teams, each consisting of a pilot and a navigator, were chosen at the first SA ANR Championships held in Brits in August, and were accompanied by World class Judge Arddyn Moolman, and supporters Barbara Friebose and Leon Bouttel. 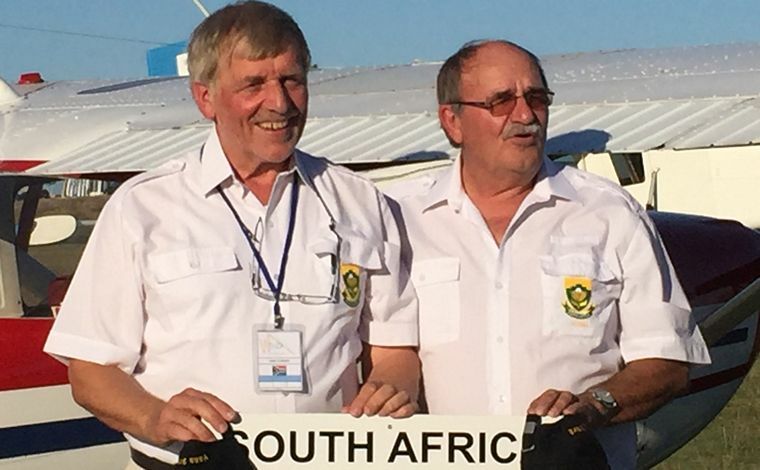 The men who represented South Africa at the 1st ANR World Championship in Castellon. Frank Eckard, Hans Schwebel, Thys van der Merwe, Ron Stirk, Leon Bouttel. The team, consisting of Hans Schwebel and Ron Stirk, Mary de Klerk and Thys van der Merwe, and Frank and Cally Eckard, took advantage of the training week in which they managed to complete all the training routes. 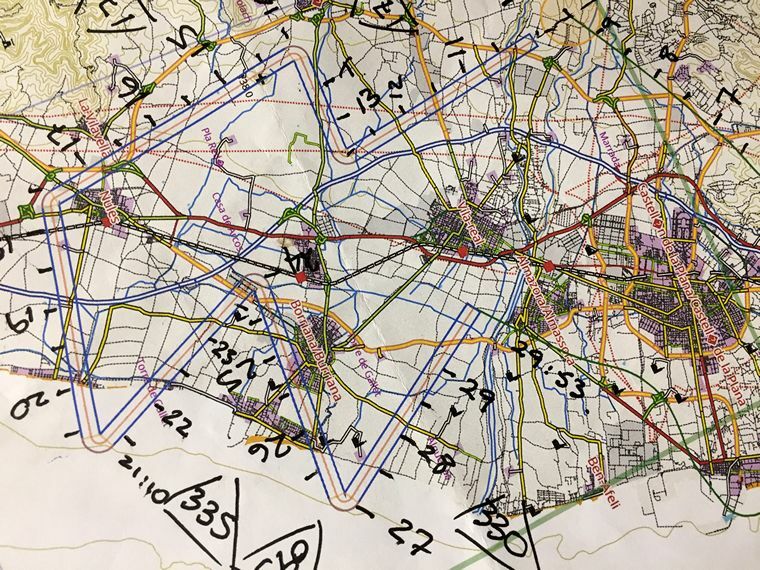 Having practised in SA on 1:200 000 maps and flying at a nominated speed of 80 knots, they discovered that the local rules required them to fly on 1:150 000 maps at a speed of 75 knots. Taking this all in their stride, they also discovered that their Cessna 152 had not arrived, and was only going to arrive all the way from Portugal three days late. However, they made a plan and even had to fix the mag drop on the Portuguese plane when it arrived, costing them another day of practise. Also, the local aircraft mechanic had to be coaxed out of church to fix the plane, and arrived without any tools. 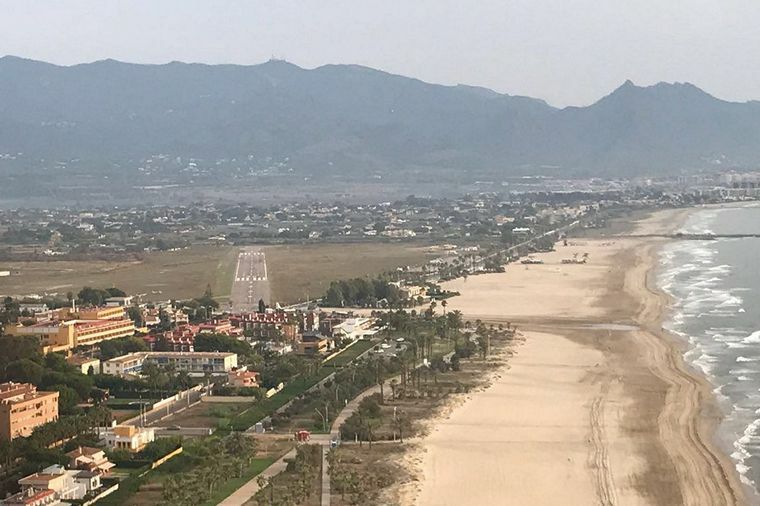 Another challenge was obtaining fuel, which is outsourced at Castellon airfield, and is closed for siesta between 2 pm and 3:30 pm, causing much consternation when practise time is already compromised. A section of the map for Stage 4 of the World ANR Championship, showing the route going out to sea, forcing the teams to estimate the turns using timing and speed. Other “turnpoints” are not necessarily features, and may be in the middle of nowhere. The area of Castellon is a large coastal plain surrounded by mountains reaching up to 2000m, making for a very varied and challenging task. Compared to SA, their maps are extremely accurate and up-to-date and contain contour lines rather than hypsometric tint. Initial training flights enabled the participants to decipher how what is on the map appears on the ground. Training on Google Earth before they arrived in Castellon helped familiarise themselves with the terrain. 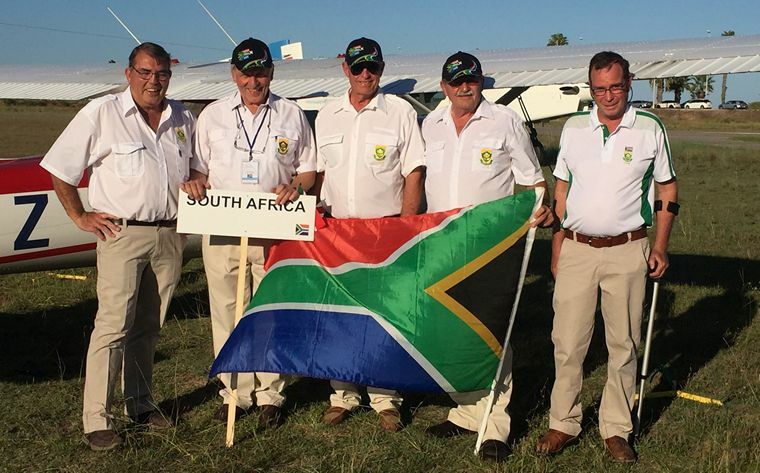 Despite being handicapped by flying unfamiliar aircraft (the other teams were all from Europe and all except for Cyprus and Norway flew their own aeroplanes) the South African team were placed 14th, 19th and 22nd out of 32 in the Navigation Section of the competition. This consisted of 4 stages held over 4 days. The final portion of the competition was the Precision Landings, consisting of two normal landings and one forced landing (glide approach without flaps) in which the pilot has to land as close to the one metre landing line as possible. Penalties are given for landing outside the line. 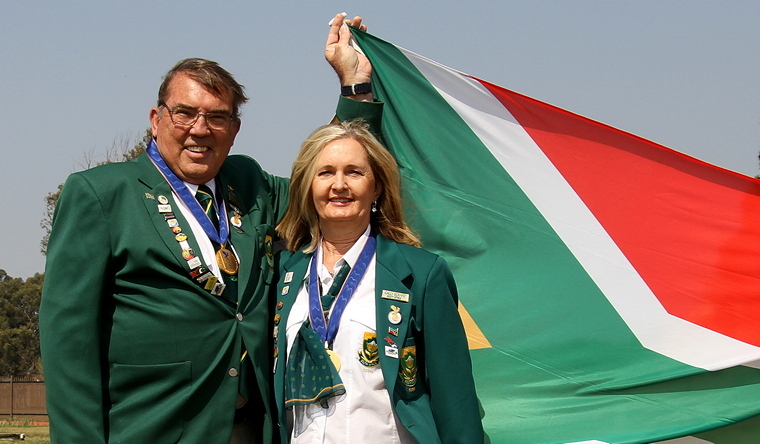 Here the SA team is traditionally feared by the European countries, as we have a World Air Games gold medallist in Frank Eckard, a twice World Landing Champion in Ron Stirk, and a several time SA landing champion and runner-up World Champion in Hans Schwebel. The team did not disappoint, with Frank and Cally Eckard winning gold with two landings on the zero line and one 3m after it, Mary de Klerk coming 7th and Hans Schwebel 15th. A view of the screen visible to spectators at the ANR World Championships. 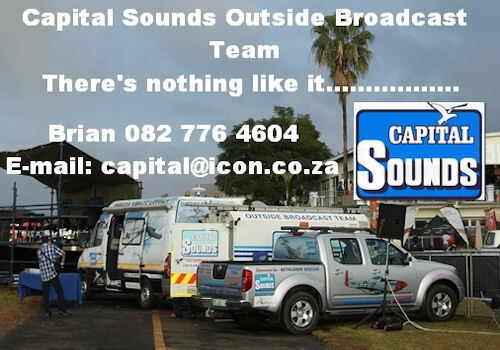 Viewers from SA were able to watch the action live on their devices, and big-screens were set up at Castellon Aeroclub for fellow participants to watch other contestants attempt to beat their scores. This form of the sport is gaining very quickly in popularity both amongst newcomers to flying and to current Precision and Rally pilots. It requires far more teamwork and input from the navigator as they work together to maintain their course along a software-created zigzag “corridor”. It is much shorter in distance and duration, and requires fewer volunteers, making it much more affordable. The software is easier to use, making it much quicker to plan and organise, and the trackers which are placed in each plane enable spectators to watch the progress of each team either at the airfield on big screens, or on any device, make it a very exciting spectator sport. Frank and Cally Eckard received gold medals for their magnificent performance in the Landing Competition. Second was Switzerland, and third Norway. The sport is designed to improve fundamental flying skills, emphasizing the ability of the crew to follow a precise track whilst adhering closely to a time schedule, a given corridor and a groundspeed. The Landing portion emphasizes the ability of a pilot to land an aircraft in short and narrow places with the simulation of trees or other obstacles on the approach, thereby fully demonstrating his or her ability to handle an aircraft both accurately and safely. The rules are deliberately kept simple and easy to remember, to encourage young and new pilots to participate in a fun and challenging but “doable” flying sport. Frank and Cally Eckard placed 14th in the navigation section and 1st in the landing section of the competition. Hans Schwebel and Ron Stirk placed 22nd in the navigation section and 15th in the landing section of the competition. 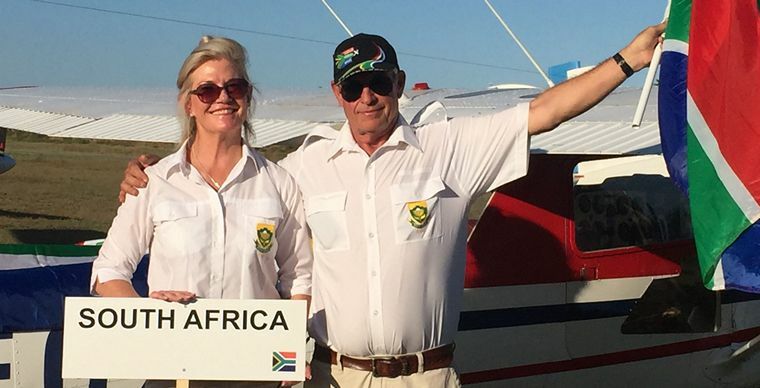 Mary de Klerk and Thys van der Merwe placed 19th in the navigation section and 7th in the landing section of the competition. Being the first championship held on the world stage, some minor changes will have to be made to the model, but currently the rules give each team 30 minutes to plan their flight after being given a map with the printed “corridor” on it. They then have 15 mins to jump into their aeroplane, and have to take off at a predetermined time, and are given a particular time to fly to the Start Point. The Start and Finish Points are the only points which are timed, and the whole competition is flown at a speed determined by the organisers. 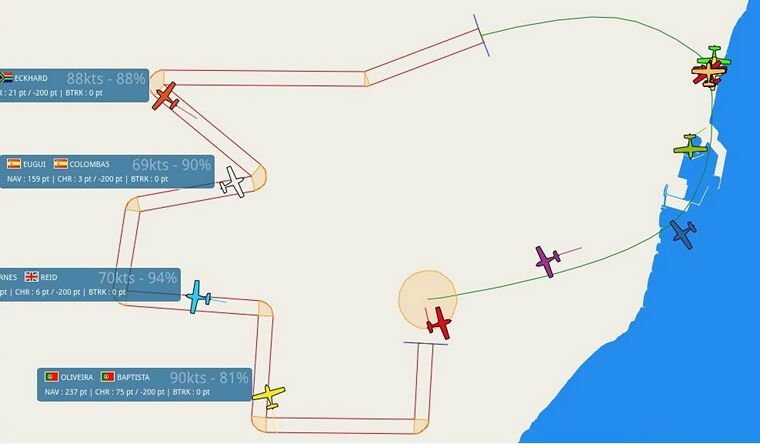 The route is approximately 45 mins long from take-off to landing, and requires the participants to fly along the narrow “corridor” which is a series of zigzag legs with “turnpoints” at any place on the map, not necessarily a feature. For more information regarding Air Navigation Race please go to: www.fai.org/gac-our-sport/air-navigation-race and please look out for more ANR events hosted by SAPFA.